When we think of autumn, the first image that comes to mind is colorful leaves falling from the trees. Leaves, however, aren’t the only thing falling in the fall. This is the season of the nut as well, and many species of wildlife rely on nuts for survival. Gambel oak acorn. Photo by Bryant Olsen via Flickr Creative Commons. Nuts are produced exclusively by deciduous trees and shrubs. Peanuts are not true nuts, they are legumes that grow underground, and pine nuts are technically edible seeds. The botanical term for nuts is “hard mast,” as opposed to “soft mast” like berries and other fruit. Just like soft mast, nuts are formed when the blooms of trees and shrubs are fertilized by wind or by pollinating animals. Nuts are high in carbohydrates, protein and fat, and also contain the seed of the plant. The carbs, protein and fat lure hungry wildlife in fall looking to fatten up for migration, for hibernation, or to build up a reserve for the oncoming winter. Animals consume the nut and then plant the seed in their droppings or by caching nuts and forgetting about them, allowing the seeds to germinate and form new plants. Acorn woodpeckers stash nuts for later use. Photo by Don DeBold via Flickr Creative Commons. A wide variety of wildlife feed on nuts in the fall. Squirrels are perhaps the most obvious, but other rodents such as chipmunks and the many species of native woodland mice feed on nuts. Even large mammals such as deer and black bear rely heavily on nuts in the fall. Many species of birds also feed on nuts, including jays, woodpeckers, band-tailed pigeons, wild turkeys, ruffed grouse and wood ducks. There are several native nut-producing woody plants in North America. They include the many species of oaks and hickories, as well as American beech, black walnut, chinquapin, butternut, hazelnut, and pecan. (The American chestnut was once the dominant nut-producing tree over the eastern part of the country, but has disappeared in the last century due to an exotic chestnut blight.) Pine nuts are also highly prized by wildlife as a food source, even though they are not true nuts. 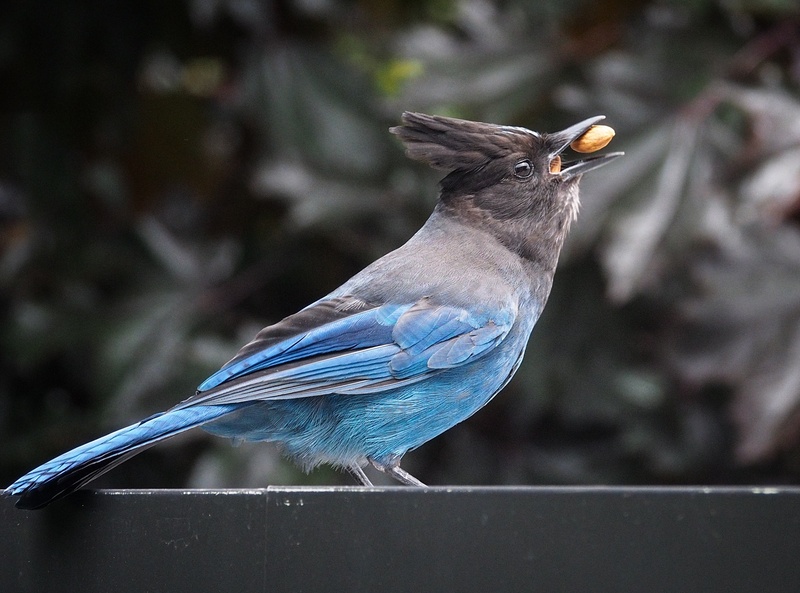 Stellar’s Jay eating a nut (in this case an almond from a feeder). Photo by Ingrid Taylar via Flickr Creative Commons. Like all native plants, native nut-producing trees are adapted to local soil, rainfall and temperature conditions, and have natural defenses against insects and disease. As mentioned in the many ways above, native wildlife rely on these trees as an essential part of their native habitat. September through early November is the best time to collect nuts. You can germinate them for planting in your garden and throughout your community, or even to give as gifts. You can also collect seeds to help with local conservation efforts. Many state forestry services have nurseries to grow native trees for use in reforestation and stream bank restoration. They often partner with local nonprofits and watershed groups in nut collecting drives each fall. In addition to the benefit to wildlife, demand for the planting of native hardwood trees has increased to minimize erosion and to restore urban tree canopies to help keep our cities and towns cool. Trees on river banks can absorb pollutants and prevent them from getting into the watershed. Wild hazelnut. Photo by Illona L via Flickr Creative Commons. Check with your state department of natural resources and forestry, local conservancy or watershed groups to locate nut collection drives. You–along with your community group, scouts, students or faith groups–can play a role in making sure there are plenty of nuts for wildlife! Chinquapin nuts collected in Washington, DC. Photo by David Mizejewski. Pick a spot to collect. This could be your neighborhood, your local park, a wilderness area, or even along roadside. Anywhere nut-producing trees grow is a good spot. Collect nuts that have fallen to the ground to ensure ripeness. Avoid nuts that look damaged or moldy. You can also shake the branches to cause ripe nuts to fall. A long stick can help you reach higher. Bring a field guide to help you identify the tree or shrub species from which you are collecting. Keep each species’ nuts separate. While humans enjoy a good nut mix, it’ll make it harder to know what you’ve collected if they’re all together. This is especially important if you’re collecting for your state forestry department. Collect your nuts in a sturdy burlap bag to allow them to breathe and prevent mold. Depending on the species, for long term storage you might need to switch to a plastic bag filled with damp sand or vermiculite or a moist paper towel, which will keep the nuts from drying out. Nuts that dry out during long storage won’t germinate. Label each bag with species, location collected and date of collection. Different species have different requirements for germination and planting. Some will need to be refrigerated for a few months to simulate winter conditions before they will germinate. Do web research on the right germination procedure for the species you’ve collected. Here’s a good resource for oaks, one for walnuts, one for pecans, and a good general list of instructions for a variety of nut-producing trees. Don’t be greedy. Leave some nuts for wildlife. 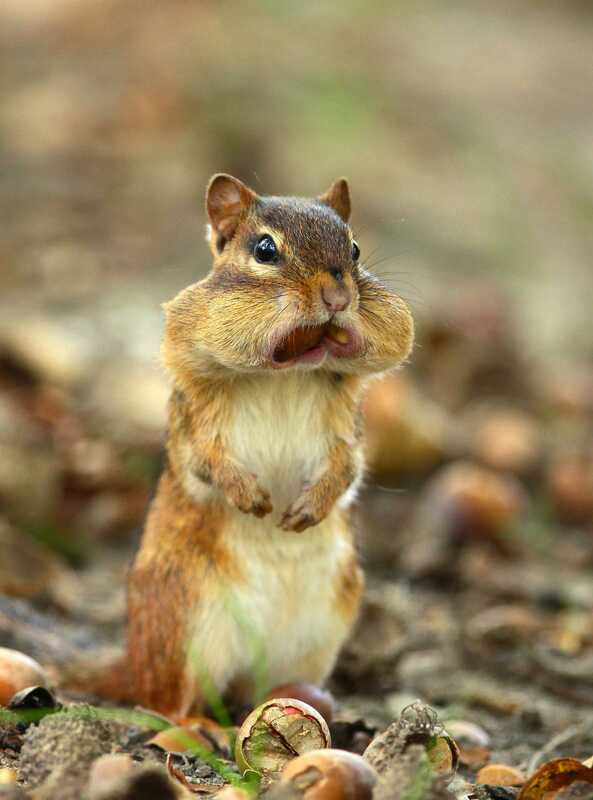 A chipmunk collects nuts. Photo by Peggy Hanna. Grow native plants that can provide food and shelter for your backyard wildlife!